PreSonus' FaderPort 16 is a quality control surface for working with your favorite digital audio workstation (DAW). Even though keyboard and mouse are tried-and-true, reliable DAW-control devices, they can be much more effective when used along with this unit's precise tactile mix and automation control functions. 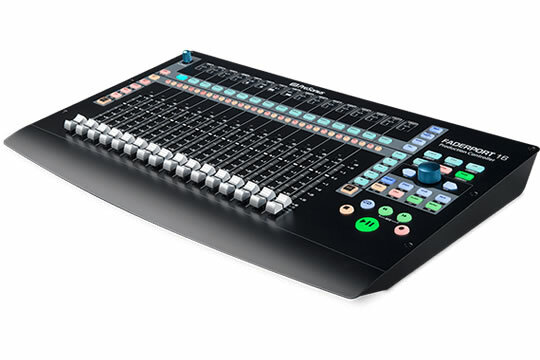 An enhanced solution for anyone who mixes in the box, only the FaderPort 16 offers 16 100mm touch-sensitive, motorized faders plus 89 buttons that cover 104 different functions – all housed in a compact chassis that can easily sit on any desk. You can quickly zoom in on audio files to edit, adjust plug-in parameters, manage aux mixes—and of course, control track levels, all with the touch of a finger. FaderPort 16 lets you enjoy your quickest, most efficient DAW workflow.